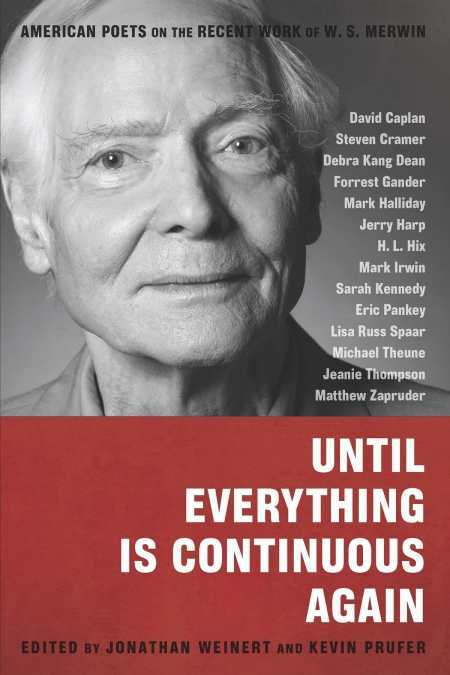 In this volume, fourteen essays and one interview address Merwin’s recent work, focusing on*The Rain in the Trees,*of 1988, and eight subsequent books. As one might expect from a critical work, the contributors mostly wrestle with notions of poetics: the limits of language, use and energy of the line, narrative versus the lyric, open and organic forms, the qualities of odes. At times the lens opens wider to consider social, ecological, or political concerns. The essays are studded with close readings of individual poems. What emerges are two portraits. One, of course, is of Merwin: long fascinated by origins, journey, and absence, his remarkable serenity is supported by his belief in the connection “between the human imagination and all of life.” Language is his both problematic and exquisite medium, and loss carries not only personal but social and cultural dimensions. The other portrait is of American poet-dom, or perhaps of academia, preoccupied by its literary theories. The most luminous and humane moments occur when a writer allows him or herself to appear on the page. Debra Kang Dean, for example, recounts “the experience of homecoming that reading [The Rain in the Trees] represented” for her, a native of Hawaii. Matthew Zapruder deftly relays the folly of thinking too highly of one’s theoretical prejudices. Sarah Kennedy muses on the relationship of poetry to current events, remembering a soldier student—traumatized, numb—as a symbol of the collateral emotional damage of this era. This book is best used as a companion to Merwin’s work. Readers interested in poetics will find useful detail here. Those interested in a more general discussion will find fewer, but no less valuable, insights into contemporary poetry’s project. While Merwin is certainly proficient and comfortable discussing technical concerns, a perhaps unintended feature of the book is the contrast between esoteric analysis of poetics with the universal value of the sensual. In response to an interviewer who asks, “In what sense is absence the threshold of paradise?” Merwin immediately returns the question to direct experience. “Have you ever lost anything?” he asks. “Yes,” says the interviewer. “So you know,” says Merwin. And then he laughs.